I am so excited to be participating for the first time in the Great Food Blogger Cookie Swap! Hosted by my friends Julie at The Little Kitchen and Lindsay at Love & Olive Oil, this event is in its 5th year. Along with hundreds of other food bloggers across the country, I baked cookies, mailed a dozen of them to three different bloggers, and then received three dozen cookies in return. And yes, there is awesomeness in baking cookies, giving cookies, and receiving cookies, but the really fabulous thing going on here is that all of this is to support a great cause, Cookies for Kids’ Cancer. Last year, the Great Food Blogger Cookie Swap raised almost $13,000. I can’t wait to hear what the tally is for 2015! So c’mon, let’s check out what I baked for the Cookie Swap, these Chocolate Dipped Orange Shortbread Cookies. They sport a sprinkle of dried cranberries, chopped pistachios, and flaky sea salt. So very good. Also be sure to peruse the #fbcookieswap hashtag on instagram for more cookie awesomeness! 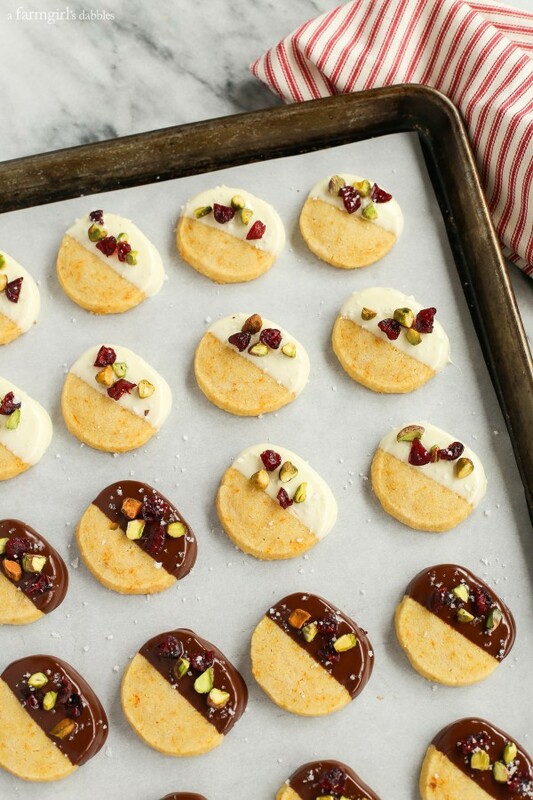 These shortbread cookies are adapted from recipes from both co-hosts of the Cookie Swap. Last winter, Julie stayed with my family while visiting Minnesota, and she brought a package of her awesome Dark Chocolate Dipped Funfetti Shortbread Cookies for us. I kinda fell in love with them. Alot! And it turns out that Julie had played with a recipe of Lindsay’s, her gorgeous Bourbon, Brown Butter, and Vanilla Bean Shortbread Cookies. I love how recipes get shared amongst friends, home to home to home. It makes the world just a little smaller, and a whole lot sweeter. The cookie dough in this recipe is flecked with a good amount of fresh orange zest, giving a super lovely flavor. But the heart of these cookies is butter. That’s what draws everyone to shortbread cookies, right?! So I decided to not cut any corners, to get the most awesome butter flavor and texture that I could. I used the new Land O Lakes® European Style Super Premium Butter. Once the cookies have baked and cooled, they are dipped into chocolate and then sprinkled with goodies. My original plan was to dip all the cookies in dark chocolate. But then, after talking with Julie, she sparked the idea to give white chocolate a try. So I tried it both ways, thinking I would have a definite favorite and would just share that. But I couldn’t choose. Imagine that. Me, the lover of dark chocolate. The naysayer of white chocolate! These cookies are buttery delicious, with a bright fresh orange flavor for contrast. 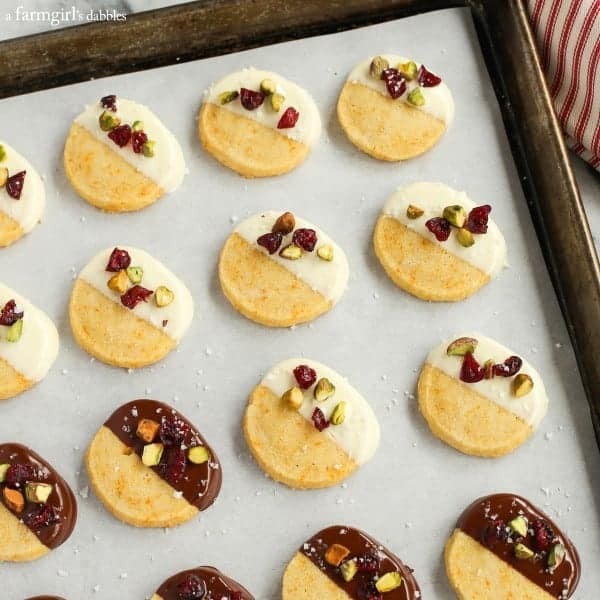 With a half-dip into dark and white chocolates, and then a sprinkling of dried cranberries, pistachios, and flaky sea salt, they’re beautiful and festive. Perfect for a Christmas platter. I wonder which ones will disappear first, the dark chocolate dipped or the white chocolate dipped. What’s your vote?! In a small bowl, whisk together flour, cornstarch, salt, and orange zest. Set aside. In the bowl of a stand mixer, cream together butter and sugar for two minutes on medium speed, scraping down the bowl halfway through. Add vanilla extract and beat until mixed in. Add the dry ingredients in two batches to the butter and sugar mixture, mixing on medium speed until all ingredients are combined. Do not over mix. Divide the cookie dough in half. Add first half to a long piece of plastic wrap. 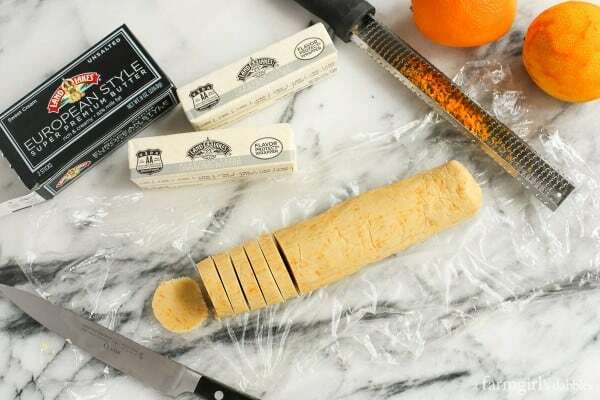 Shape the dough into an 8” long log that is about 1-1/2″ thick, and roll up in the plastic wrap, twisting and tucking ends underneath to secure. Repeat with other half of the dough. Chill both wrapped dough logs in refrigerator for at least three hours or overnight. Unwrap chilled dough logs, cut dough into 3/8″ thick slices, and place on parchment paper lined baking sheets. Bake for about 12 minutes, or until done. Let cookies cool on pan for one minute before removing to wire racks to cool completely. In a small bowl, gently melt the white chocolate and 1/2 teaspoon of the shortening in the microwave in 30 second increments, mixing thoroughly between each heating so the white chocolate doesn’t scorch. Dip a cooled cookie into white chocolate halfway and allow the excess white chocolate to drip back into the bowl. Very gently scrape the underside of the cookie along the side of the bowl to remove excess chocolate on the underside of the cookie. Place dipped cookie on a wax paper lined baking sheet. Dip a few more cookies and then sprinkle a few chopped cranberries and pistachios on top of the white chocolate. Finish with a sprinkle of flaky sea salt. Repeat until you have dipped half of the baked cookies into the white chocolate. Now repeat this process with the remaining half of the cookies, this time dipping the cookies into a mixture of semi-sweet and bittersweet chocolate. In a small bowl, gently melt the semi-sweet chocolate, bittersweet chocolate, and 1/2 teaspoon of the shortening in the microwave in 30 second increments, mixing thoroughly between each heating so the chocolates don’t scorch. Dip one of the cooled cookies into chocolate halfway and allow the excess chocolate to drip back into the bowl. Very gently scrape the underside of the cookie along the side of the bowl to remove excess chocolate on the underside of the cookie. Place dipped cookie on a wax paper lined baking sheet. 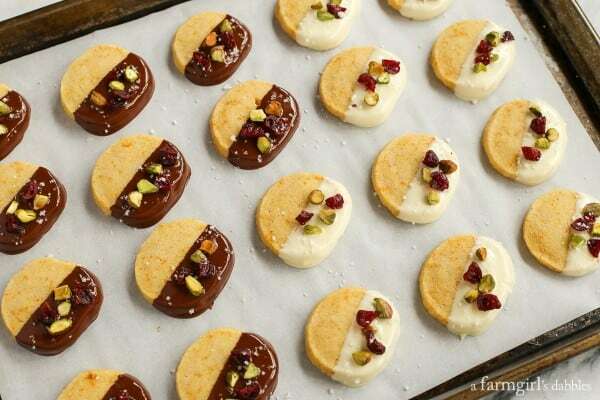 Dip a few more cookies and then sprinkle a few chopped cranberries and pistachios on top of the chocolate. Finish with a sprinkle of flaky sea salt. Chill dipped cookies in the refrigerator for 15 to 20 minutes to set the chocolate. 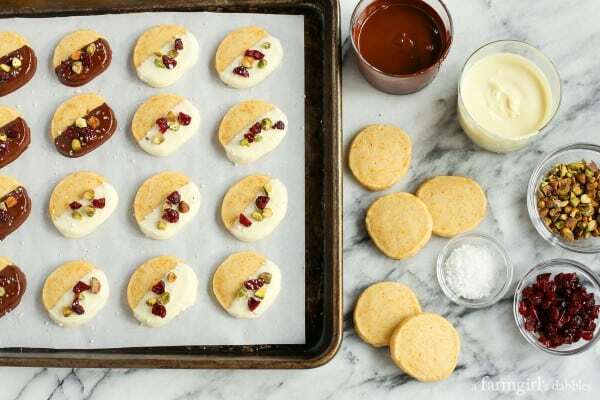 Adapted from shortbread cookies created by The Little Kitchen and Love & Olive Oil. I wanted to send a shout-out to Land O’Lakes, Dixie Crystals, and OXO, for being such generous brand partners of the Great Food Blogger Cookie Swap, each matching our donations (up to $3,000) and sending out coupons and goodies for us to bake with. Thank you!